Typography, the art of font making, is now accessible to everyone thanks to technology. But that doesn't mean it's easy. Even for someone with artistic talent and the patience to create a set of glyphs that together make up a font, there's a little math and a lot of computer science involved. Type 3.2 helps you out with many--but not all--of these aspects of typography. As font makers go, Type 3.2 is not hard to use. The tools in your Type Toolbox will seem familiar if you've ever used a painting or design program. You get a pointer for selecting nodes, a knife, a freehand pencil, and simple shape tools for drawing rectangles and ellipses. Using these tools to create a glyph design from scratch is more difficult than using a graphic design program (such as the $89 Xara Photo & Graphic Designer) and tracing the glyph; but with perseverance, Type gets the job done. 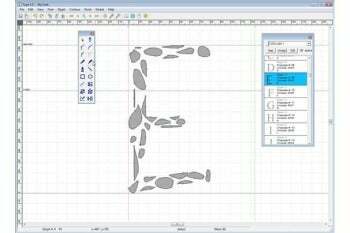 The curve tools, for example, are confusing at first: Type includes tools for creating a Corner Curve, a Smooth Curve, a Straight Corner, and off-curve nodes, as well as a pen for adding straight lines and a fully freehand tool. Much like FontCreator (which costs $100 for the Home Edition and $250 for the professional version, which permits commercial use), Type lets you trace a glyph that you've created in a drawing program. Type does this extremely well if you have a clean, well-sized vector sample. I also like that Type includes a slider for increasing or decreasing the number of nodes (nodes are the points that make up the curves of your glyph; generally, the fewer nodes you have, the smoother your glyph will look). The node slider is a useful feature that FontCreator doesn't offer. Be aware, however, that the demo version of Type places an X over traced images, rendering them useless. Though Type is relatively easy to get started with, you'll have to overcome some difficulties to create a full font. For one thing, using Type to create glyphs that incorporate bits of other glyphs (as most fonts do with the beginnings of the characters for m and n, for example) is not intuitive. And learning how to use Type to fill certain areas of a font and leave other areas transparent (to create a defined look with a 3D font, for instance) takes some time and research. The video tutorials and help menu for Type are informative and--for the most part--easy to follow for basic concepts; but as you advance as a user, you'll find yourself having to rely more and more frequently on trial-and-error. The demo version of Type doesn't accurately reflect the full program's power and ease of use; in my testing on Windows Vista PC, the Type demo behaved obstinately and annoyingly, whereas the paid version of Type worked smoothly. If you're in the market for a font designer and packager, Type has two key advantages over FontCreator: It costs less, and you can use the resulting fonts commercially. If the demo version doesn't give you enough access to features, you can try downloading the free Type 3.2 Light. This version of the software omits the Freehand, Glue, Knife, Touchup, Trace, and Transform tools; but even so, it gives you a better idea of how the software works than the demo version does. CR8 Software provides a features comparison chart showing all of the additional features available if you purchase Type 3.2. Frustration seems to be a natural hazard in creating fonts, but Type tries to make the process easier. The online tutorials are helpful, and the program is relatively easy to use--even for someone with limited knowledge of fonts, glyphs, and characters. Nevertheless, you'll need to do your math, science, and art homework to make it work well. An OpenType font editor and creator, Type 3.2 makes personalized fonts accessible to all.